The long wait is over and this is what all you’ve been waiting for! COME AND JOIN THE FUN! Gather now and get your moves ready, for the quest is on! Elimination will start on a per area basis, be the best by becoming the City Champion and be one of the three representatives of your area to compete in the Finals that will happen this December. The Best HighStreet5 player in the Philippines will receive an iPod Touch and rare in-game items! Ramp the streets in speed and in style with your very own FOREVER MotorBike and be recognized as the best player of the game! What are you waiting for- holla your friends and REGISTER NOW! Groove your way up to stardom! Take your game to the next level. JOIN THE SURVIVAL CHAMP ’09 QUEST – The Official HighStreet5 National Survival Tournament! 1. Visit the designated tournament venues on the scheduled dates. You can refer to this LINK for the list. 3. Just arrive at the venue in schedule and pay for the P50 registration fee that will not only get you access to participate in the tournament, but get free in-game items too! 4. Registration is on a first-come-first-served basis. A maximum of 20 participants can join per location on a given schedule. 2. Contest will have 10 contestants per batch to avoid LAG problems. 3. Only one (1) contestant will win every batch. 4. Dance mode: Easy level – 4 Keys – Song mode. 5. All stunts and buff items are allowed during the contest. 6. The contestants’ objective is to avoid “MISSING” any key. 7. If the contestant “MISSes” any key, he/she will be automatically eliminated. 8. There will be 5 random/SR requested songs per batch. * First violation – Warning to the contestants who have requested a song. * Second violation – The contestant shalll be disqualified from the contest. This is to avoid delay in the event. 10. In such case/s the contest will start on the next song after the contestant’s requested song. 11. In case of dispute, the decision of Eaglegame International and its affiliate is final. 1. What are the area division during the Nationwide Tournament? 2. Who will be named City Champs? 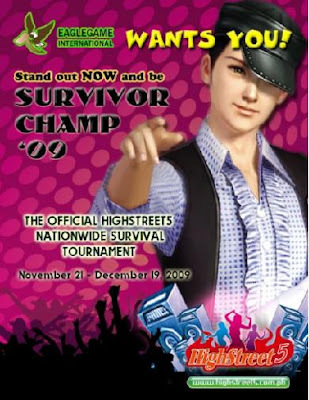 During the elimination round starting November 21 – December 5, 2009 only one (1) winner per week per area will be chosen. Total of 30 winners will be named City Champs, three (3) players from each Area mentioned above. The three (3) winners will be tagged as a team as to which area they came from. 3. Who will compete in the Division Round? All 30 City Champs will battle against each other and will be divided into 2 divisions. 4. Who will win the Division Round and will qualify to compete during the Regional Rounds? Only one (1) winner will win for each Division. 5. How many are qualified to participate on the Regional Rounds? * Six (6) Players will compete during the Regional Rounds. * Three (3) players coming from each division. 6. How are the participants in the Regional Round chosen? 7. Who will win the Regional rounds? 8. Who will compete in the Semi-Finals round on December 19, 2009? * Total of three (3) players who will compete for the end title of Survivor Champ ’09. 9. Who will win the title of Survivor Champ ’09? 1. In case of tie between 2 or more contestants after the 4th song. The Final/5th round will be based on Ranking battle without “MISSING” any keys. 2. In case that there are no winners on the batch; the contest will have a 1 round Ranking battle without “MISSING” any keys, all eliminated contestants will join the round. 3. LAG problem is a common issue; contest will still continue even if it is LAG. 4. In case that the player is disconnected during the contest; the GM/Host will investigate the issue for consideration/disqualification of the disconnected participant. The disconnected participant will join the next batch of the contest if the consideration is approved. 5. NO REFUND of entry fee if contestants back-out before/during the contest. 6. In case of dispute, the decision of Eaglegame International and its affiliate is final. WHAT ARE YOU WAITING FOR? JOIN NOW AND BECOME A PART OF HIGHSTREET5 HISTORY!!! !